It is not unusual to watch videos on your new iPhone, but what would you do if you do not know how to transfer videos from PC to iPhone without iTunes. iTunes is a very old iOS app that has ruled over the market for decades but recently users have started questioning the efficiency and the reliability of the said app. It is mainly because iTunes has lost a lot of user’s data during transfer. So, a large number of users are looking for other convenient options. Needless to say that there are other very effective apps available on the market, some are paid and some are available for free of cost. In this article, we are here to detail everything you need to know about all these apps and how to use them to transfer videos to iPhone. If you are still stuck on how to copy videos from PC to iPhone without iTunes then first you can take a good look at Tenorshare iCareFone. It is the great software you should go for. It supports all kinds of video files, other media files, contacts, SMS etc. The app is very fast and unlike other apps, it can complete the data transfer just within 3 steps. 2-way data transfer from iPhone/iPad/iPod to computer and vice versa. 2. Connect your iPhone and PC with a USB cable. It will be a few seconds until your device gets detected. 3. Then go to "Manage" on the panel. 4. From the list of various data types choose "Videos". 5. Finally, click on the Import button at the top of the panel to transfer the selected videos to your iPhone. Tenorshare iCareFone performs a complicated task very easily. The user-interface is very simple and apart from that, unlike other apps, it can also transfer data from iPhone to PC/Mac. So, if you do not know how to import videos from iPhone to PC without iTunes, Tenorshare iCareFone will be of great help to you. Don’t miss it! 1. Run Dropbox on your PC. 2. Sign-in to your Dropbox account. 3. Select the videos you want to transfer to your iPhone and just drag and drop the files to the Dropbox folder on your computer. 4. Now, open your iPhone, download Dropbox and sign-in to your Dropbox account. 5. Just download the videos from Dropbox on your iPhone using the download option. 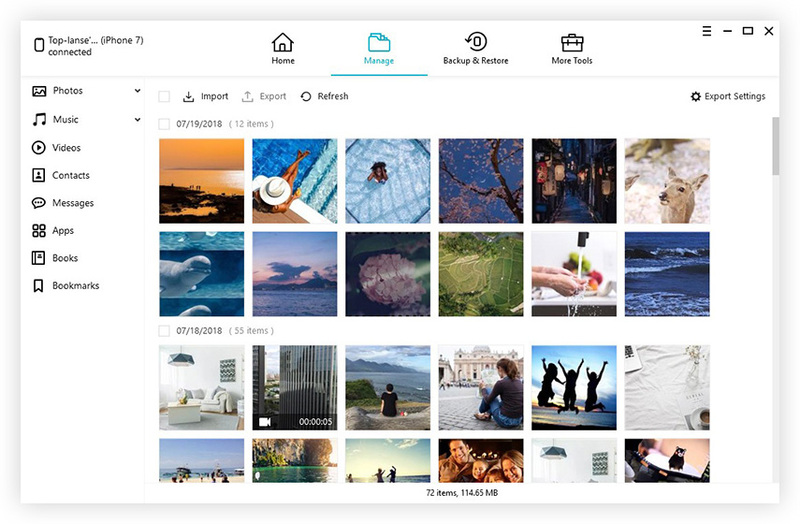 It is evident that Dropbox is a very simple but efficient app, it has a free version and a premium version and you can use any one of them according to your convenience. It comes with 2GB of free storage space initially. If you want to transfer video files to your iPhone without using iTunes then look no further than your Mac. Yes, Mac has AirDrop which can help transfer videos wirelessly! The AirDrop app was launched with the new MacOS X for wireless data transfer between iOS devices. As the popularity of the iTunes app has fallen down, a lot of users wonder how to transfer videos from iPhone to computer without iTunes, without even realizing that Apple has already provided them with the countermeasure. 1. Open Photos app and tap the share option. 2. Under Share option, find and select AirDrop from the list. 3. Now, you will see a prompt asking you to turn on AirDrop. 4. If the Bluetooth is not turned on, do it manually, but, usually, it gets turned on with AirDrop. 5. Now, go to your iPhone and launch AirDrop from the Control Center. 6. Finally, tap “Accept” to receive the files on your iPhone. AirDrop is able to transfer files very fast. It uses Bluetooth and the Wi-Fi network to transfer data from one iOS device to another. Just be sure to put the devices in a close proximity, within the range of the app. As you can see Dropbox and AirDrop both are established apps on the market and they function pretty well. The AirDrop app comes with the MacOS, so it is free and it is able to transfer data wirelessly between iOS devices but Dropbox provides cloud services that work on both PC and Mac as well as in other platforms. Now, finally, when it comes to Tenorshare iCareFone, it is an app that simply transfers your data from device to device without any issues whatsoever. It is simple yet very effective when it comes to usability. If you are still wondering how to transfer videos from iPhone to PC without iTunes easily, you can just go for Tenorshare iCareFone to get it done perfectly. Go for it!